Chris Anderson puts forward the idea that the future of Television is being created by today’s youth in the video below…..brad…. Wow. Does the television industry really want to black out US programs if they can’t simulcast? Given the rates that the Cable and Satellite charge will Canadians drop those services when they start seeing blacked out channels? A discussion below on TVO’s Agenda. Michael Geist has been blogging a lot lately on the Anti-Counterfeiting Trade Agreement talks that are going on in secret. Here is his speech on the agreement, presented at American University Washington College of Law, in Washington, DC on November 5, 2009. Lynda receiving the SMPTE 2009 Eastman Kodak Gold Medal Award for her role as an education pioneer. Lynda is the first woman to receive this award. One service that I subscribe to is lynda.com. It was great to see Lynda Weinman win The Eastman Kodak Gold Medal Award in Hollywood on October 29th, 2009 at an event that I attended. It turns out that Lynda Weinman was the first woman to win The Eastman Kodak award with the Society in their 37 year history as of now. She was awarded for her contribution to education of technologists and practitioners in the field of media production in particular, as a pioneer in online education through creation of the website lynda.com which provides affordable, interactive training programs for film, television, sound and web production. Way to go Lynda…. Video below…. Whew! What a title…. But I’m hoping that the title will assist people with finding this blog post on the Internet…. Over the past few months, since the arrival of my HDTV, I’ve been spending some time setting up an antenna and trying to capture as many free over-the-air HDTV stations as possible. One of the big problems I had was trying to find information on an antenna. It was not only a decision on deciding what type to get but also how to set it up. It was very hard to find suppliers in Canada and it was also difficult to find easily obtainable (and understandable) information on how to go about installing something that might actually work. This blog post is my story and it’s my hope that you might benefit from it. My first cuts at getting HDTV reception actually occurred several years ago. However I was hampered by location (Etobicoke, ON), a small number of HDTV transmitters that were on low power (pre DTV switchover in the US and still low power in Canada) and most of all by not having a suitable antenna. For those of you new to HDTV you are probably aware that it is a significant upgrade from our old analogue system called NTSC. You might not be aware however that the new over-the-air transmission system, that delivers HDTV, is called ATSC. The corresponding connection on your TV to connect an ATSC antenna is often called a DTV connection referring to Digital TV transmission. I’ve actually owned several of these ATSC tuners prior to getting my HDTV set earier this year. The first ATSC tuner I purchased was in the form of a computer card, that put the tuner in my computer. I used the computer monitor to display the HDTV picture. My first ATSC Tuner Card was ATI’s HDTV Wonder. However I never really got any HDTV reception from the card because there were few HDTV stations in my area and the antenna that was provided with the card was not capable of picking anything up in the outskirts of Toronto. My second tuner was an Hauppauge WinTV-HVR-1600 PC tuner. I purchased it for a MYTH-TV home DVR box I was building. Again I was hampered lack of a proper antenna system to pick up some of the HDTV stations that were starting to transmit in nearby Buffalo, NY. 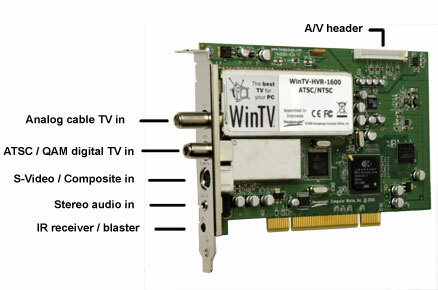 A few years later I purchased Hauppauge WinTV-HVR 950. It was different because it fin inside a USB housing but it too came with a lame antenna –as you can see by the picture below– and once again, even though we had HDTV transmissions occurring in the Greater Toronto Area (GTA) I had little success in receiving HDTV. So when I purchased a 42″ Vizio 1080p TV, set, with a built in ATSC tuner, I had to get serious about an antenna. When I mentioned the need for an antenna there were objections from my wife. She kept thinking I was talking about erecting a tower like they did way back in the 1950’s. The reality is that towers for DTV antenna’s no longer need to be built. Today’s ATSC antennas can be wall mounted, chimney mounted, a tripod mast can be placed on your roof, and some new designs that don’t even look like antenna’s. Once more you can hide your antennas by placing them in your garage or attic. The next issue I had was what kind of an antenna do I need. I had been told by engineers that the classic yaggi antenna was the best and a friend had told me about a really neat Gray-Hoverman Antenna that I could construct myself. However recalled that DTV had been designed to work just as well with a simple “bow tie” antenna. Despite all of the fanciness of the Yagi and Gray-Hooverman many people I talked to said they were getting great reception with these bow ties which many had constricted from “coat hangers”. The video below shows you how to construct a simple bow tie antenna. It shows clearly how one can cut coat hangers and arrange them to create the bow ties that act as the receptors in a classic bow tie antenna. As you’ll see in the video below the construction of these antenna’s are relatively simple and by watching the video you’ll get a good idea of how antenna’s work. You can also download the instructions in pdf form here. By the way, the work involved in building an antenna is easy and can be build by kids with adult supervision….. So understanding the principle of “bow tie” antenna’s is important to understanding the “lingua franca” of obtaining an antenna from a retailer. As you can see by the images below modern DTV bow tie antenna each of the bow ties are referred to bays and antennas are marketed in terms of the number of bow ties or bays that are on them…. Since I didn’t know how successful I’d be and I could not locate a store that I could walk in and purchase an antenna, the first antenna I purchased was a two bay Antennas Direct Terrestrial Digital Small Multi-Directional UHF HDTV Antenna from tigerdirect.ca. I surveyed my house and decided to mount it in a window inside my garage. It was a prime location for cabling as it was quite easy to pull the coaxial cable from my garage to my basement office where I had placed my HDTV set. It also had the added bonus of not having to climb up to the roof to install it. I placed it in my garage window by hanging it from a teacup holder and had my first success in tuning in some of those free OTA HDTV stations. I found I could tune CBC and CTV Toronto in HDTV consistently. I could tune CHCH (Hamilton) most of the time but stations from Buffalo were erratic as to when I could or could not receive them. Even worse it seemed weather made no difference. Some clear days and nights the stations would tune in with minimal distortion, while other days or nights with similar weather I could not tune any Buffalo stations. Even the reception from Hamilton (25 miles away) was spotty. One weekend in September I finally found some time to work on improving my reception. I had noted that on a recent trip to the multitude of Computer stores that have collected along College Street (around Spadina) were selling a variety of four bay and eight bay DTV antenna’s. Their prices were very good ranging from $25 to $60 and collectively they seemed to have plenty of stock. One store also sold Yagi’s and antenna rotors! I had finally found at least somewhere in Toronto where antennas were plentiful and there was competition around their pricing. Is A Four Bay DTV Antenna Really Be Better Than A Two Bay? In the end I purchased an eight bay antenna (which is actually made up of two four bay units) for about $50.00. This investment meant I could compare the ability of two bay, four bay and eight bay antenna’s to see what worked best for me. Initially I replaced the two bay hanging in my garage window with a four bay and noticed an immediate improvement in the stability of channels. The upgrade also added a couple of more stations but some stations, both in Buffalo and Toronto came and went depending on when I had my TV set do a channel scan. My conclusion; the four bay antenna was an improvement over the two bay. The only problem being that I was not getting as many Toronto stations as I thought I should be getting. How Critical Is Antenna Placement? A four bay antenna performed much better at picking up stations than a two bay antenna. For my use, because I did not want to do a rooftop antenna, an eight bay did not increase the number of channels I could recieve. After settling on the appropriate angle it did not make any difference if the antenna was outside or inside my garage. 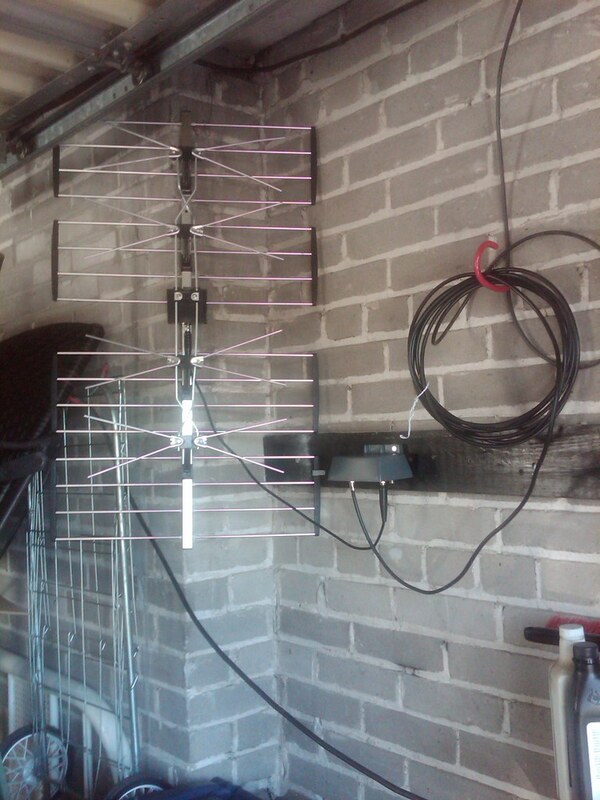 So (because it was easy) I decided to mount the antenna on the wall in my garage. The exercise of properly locating my antenna was well worth it. I had increased my brood of fairly dependable HDTV channels from eight to around 12, however fairly dependable is not ideal because I’d still find some of them not there when I wanted to watch a show on them. The solution in this case was to purchase an antenna pre-amplifier. An antenna pre-amplifier is a device that amplifies the signal that the antenna picks up. It has to be located right at the antenna. One day while I was browsing a website called hdtvexpert.com I noticed in a blog posting wherechannel reception almost doubled when a Channel Master 7777 Antenna Amplifier was added to the mix. Could this be the “killer” piece of hardware I needed? I found the 7777 easy to install because you don’t need to run power to the amplifier that needs to be attached at the antenna end. You actually power the amplifier from inside your house with a separate power supply. The Channel Master uses the coaxial cable to power the amplifier on the antenna. Because my antenna was easily accessible in the garage it only took me about 15 minutes to hook the amplifier up. When I returned my set with the amplifier active, scanned for channels once again my stations increased. After having the unit for a week the vast majority of my stations are dependable and free of the digital breakup that’s normally associated with distant DTV stations. For me the Channel Master 7777 Antenna Pre-Amplifier is the killer piece of hardware that makes the entire system work and I highly recommend it. What can I pick up? 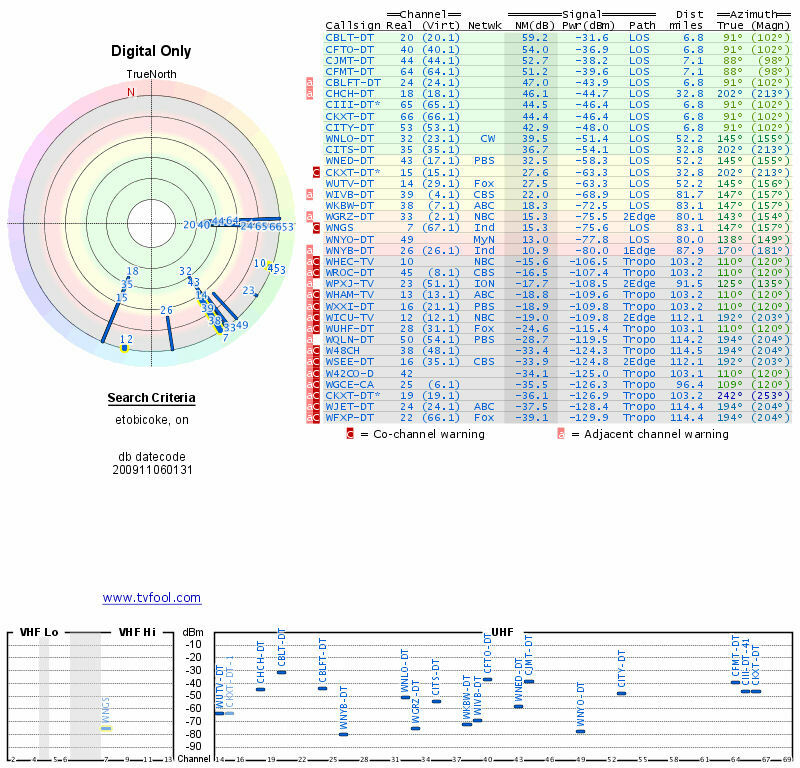 Canadian DTV Antenna Resources. Where Are They? With so much cross over in Canada with Cable and Satellite operators actually owning many DTV stations no one appears to be promoting over-the-air HDTV reception. In the United States they have a larger block of over-the-air stations because cross ownership is not allowed and PBS has been a champion of the conversion since its earliest days. In Canada its being treated as “a dirty little secret” with Cable and Satellite companies fearful of widespread adoption. They are afraid it will have a significant effect on their subscriptions. Likewise Canadian over-the-air broadcast stations appear reluctant to invest in digital transmitters and repeaters even thought they’ve had over a decade to do so. Both Global and CTV have actively pursued an agenda to drop over the air transmission in favour of directly providing Cable and Satellite companies with their signals for distribution. If these broadcasters are successful it would enslave Canadian consumers to Canadian BDU’s that have little competition and a history of annual increases that go well above inflation. So it’s important that Canadians understand that they have a good free alternative. It’s also important to insist that these over the air broadcasters, who have had a monopoly on our publicly owned airwaves for fifty years, live up to their responsibility of providing free TV to those Canadians who desire it. Canadian shouldn’t be enslaved to large corporations that deliver television as exorbitant rates. So with no corporate entity championing free over the air TV where does one get services, information and technology to get free HDTV? Where do I get the technology? Finding DTV equipment and information in Toronto can be challenging. However as I mentioned there are several computer shops in Toronto that are within a short walk of one another on College Street at the intersection of Spadina Avenue. About 1/3rd of them stock antenna’s and they are fairly competitive with one another. If you find a sale a four bay will bottom out at about $25 and a eight bay (usually $60) might be found for $50. You can purchase DTV equipment online and in Canada. My favorite place to purchase is at Sensuz Media Inc. Their website tells you their inventory and they ship very, very quickly by courier. They’ll even allow you to go to their location and pick it up if you don’t want it shipped. This was the place I purchased the Channel Master 7777 Antenna Amplifier (onsale at under $100) and it was at my door in a day and a half…. You can also purchase DTV equipment online at tigerdirect.ca and factorydirect.ca. What if I wanted someone to come and install an antenna for me? I found antenna installers are difficult to find. However I was pointed to one company V and E Antenna in the GTA area who advertises that they do it. Where Do I Get Specific Canadian Information on HDTV Stations? Which broadcaster are transmitting locally? For Canadian users, just enter your address in the “Address” field, enter your City, Province in the “City” field, and enter your Postal Code in the “Zip” Field. Just ignore the “State” drop-down menu. This is the information I got fron TV Fool. If you click on it and check it against the channels I'm receiving it is right on. Basically my stations cut off withing the yellow zone. For me to get more stations I'd have to put my antenna on the roof and employ a deep fringe antenna to have a chance at getting some of the stations in the grey area. Well that’s if for now… Given that my Rogers Cable bill is approaching $800 per year I can tell you that expense is under serious review given the number and quality of channels that I can pick up on my antenna. I’m enjoying watching those crisp and clear non compressed images that my next challenge is to figure out how to make a DVR for it…. Google appears to be growing so large that they are beginning to be mistaken for an evil company. At least that’s what Google CEO Eric Schmidt had to defend when he appeared recently on the Fox Business Network. Timelapse video of Toronto Nuit Blanche Installation: Multitorch. It was deployed at Ryerson University’s Rogers Communications Centre where I work….